A Profile of Avtech Electrosystems Ltd.
Avtech Electrosystems is a manufacturer of general-purpose and high-performance pulse generators, laser diode drivers, amplifiers, and accessories. With over 500 standard models, and a willingness to produce near-stock-price special items, Avtech has been indispensable to electronics and R&D laboratories in 47 countries since 1975! Avtech manufactures pulse generators with rise times as low as 40 ps! Pulse generators with pulse repetition frequencies (PRF) up to 250 MHz are also available. See our high-speed, high-power pulse generator selection guide for more details. Specialty pulse generators with amplitudes of up to 3000V are available, as are more general purpose models with amplitudes to 100V. See our high-speed, high-power pulse generator selection guide for more details. Avtech offers a line of high-quality, all-metal, general-purpose pulse generators. Models with ±5V, ±10V, ±50V, and ±100V maximum amplitudes are available. See our general-purpose pulse generator selection guide for more details. Avtech offers a wide range of solutions for pulsing laser diodes. Ultra-fast (200ps! ), medium current models are offered, as well as super-high-current models (up to 500 Amps!). See our laser diode driver (pulsed voltage) and laser diode driver (pulsed current) selection guides for more details. Avtech can also provide specialized test jigs designed to minimize parasitic inductance, while providing ease-of-use and safety for the operator. "One of a kind" applications can be accommodated at "near stock" prices. Contact Avtech with your special requirements! Avtech is the source for high-performance impulse generators (including impulses as narrow as 130 ps, or amplitudes to 1000V!). See our impulse generator selection guide for more details. Avtech monocycle generators can provide a single cycle of RF at any frequency in the range of 20 MHz to 5 GHz. See our monocycle generator selection guide for more details. Avtech offers general-purpose, high-voltage, and current-output function generators. General-purpose models are available at frequencies up to 10 MHz. Our high-voltage models can generate waveforms with amplitudes up to ±500V! See our function generator selection guide for more details. A line of digital frequency dividers is offered, for frequencies up to 250 MHz, and division ratios up to 65535. See our frequency divider selection guide for more details. Many of the Avtech instruments mentioned above are available with IEEE 488.2 GPIB and RS-232 ports, for computer-control purposes. See our IEEE 488.2 GPIB and RS-232 computer-control note. 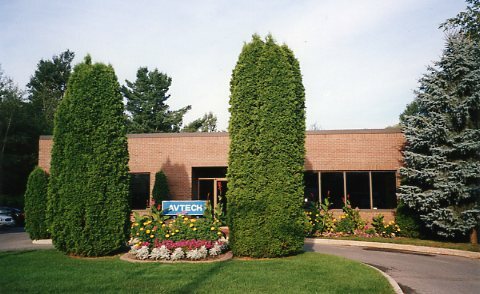 Avtech has a long history of developing special purpose products at near-stock item prices. Many of the standard items in our product line are the end result of "one of a kind" special products developed in reply to customer requests. Contact Avtech for your special purpose requirements. Our Dun & Bradstreet DUNS number is 208 910 836. Avtech is proud to be an innovative 'green' company. Read about our environmental protection efforts!